Washington DC (December 4, 2013) – Thank you Congressman Blumenauer for your courage and vision in introducing the Update Act. The half-million members of the Laborers’ International Union of North America applaud you and support this bill. 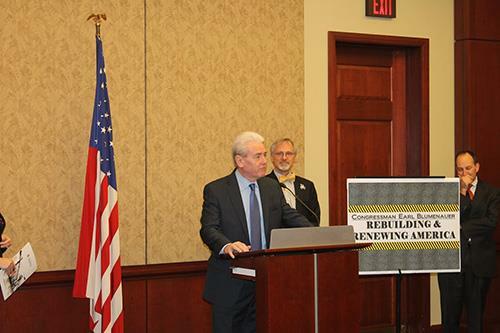 The Update Act responsibly addresses our nation’s infrastructure crisis and would raise funds needed to rebuild modernize and sustain our transportation system. Transportation infrastructure investment not only builds America. It fires up our economy and makes us more competitive. And it invests in this country’s workers and their families. Employment in the construction industry remains sluggish: more than 700,000 construction workers are unemployed. The Update Act would create good career-building, family-supporting jobs. It would put money into the hands of middle-class families whose spending supports local business and spurs economic growth. LIUNA members helped build America’s highways and transit systems while earning incomes that supported middle class lives. Today they stand ready to repair and rebuild this system and it would be irresponsible to continue to allow this system to crumble. Infrastructure investment has traditionally enjoyed bipartisan support and it shouldn’t be politicized now. Presidents Eisenhower, Reagan and Clinton all supported gas-tax increases because they knew that maintaining a strong transportation infrastructure isn’t a democratic or republican issue – it’s an American one. It is time to be honest with ourselves and with the American people. Partisan rhetoric knee-jerk reaction and anti-tax extremism will not solve this problem or make it go away. We must work together, across party lines, to support solutions, like the Update Act, that would put people to work, strengthen our infrastructure and move towards more sustainable funding. The proud strong and united men and women of LIUNA stand ready to do their part. We call on members of Congress to do theirs by supporting and passing the Update Act.